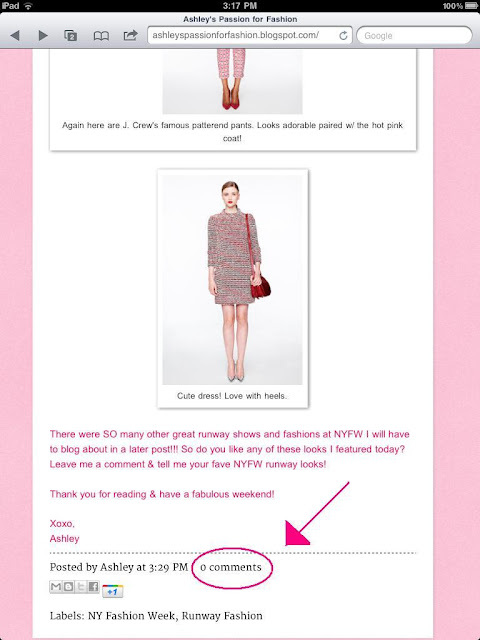 OOTNs: Weekend Edition + How to Comment on my Blog! Hello dolls! Hope everyone is having a fabulous week! Tonight is going to be a little bit of a random post...I wanted to show you my OOTNs from this past weekend AND how to comment on my blog since a lot of people have told me they're having trouble commenting! NOW: wear your sundress with boots and a sweater. Tights = optional. LATER: Wearing a sundress as the weather warms up is EASY, just substitute your boots for sandals OR wedges and go without your sweater. So moral of the story? Don’t wait until spring to wear your spring clothes! Break them out NOW, but just “winter-ize” them until the temperatures start to rise! The next night I wore my winter shorts (which Santa also brought me for Christmas!) with heels and a sheer off the shoulder top (one of my faves from F21!). While these shorts are technically "winter shorts" I will probably still wear them as the weather heats up for dressing up/going out occassions! Now on to the next order of business. Many people have told me they try to leave comments on my blog all the time but can’t figure out how to do it since they don’t have a blog! SO, upon further investigation I figured out how my lovely readers can leave me comments WITHOUT having a blog. 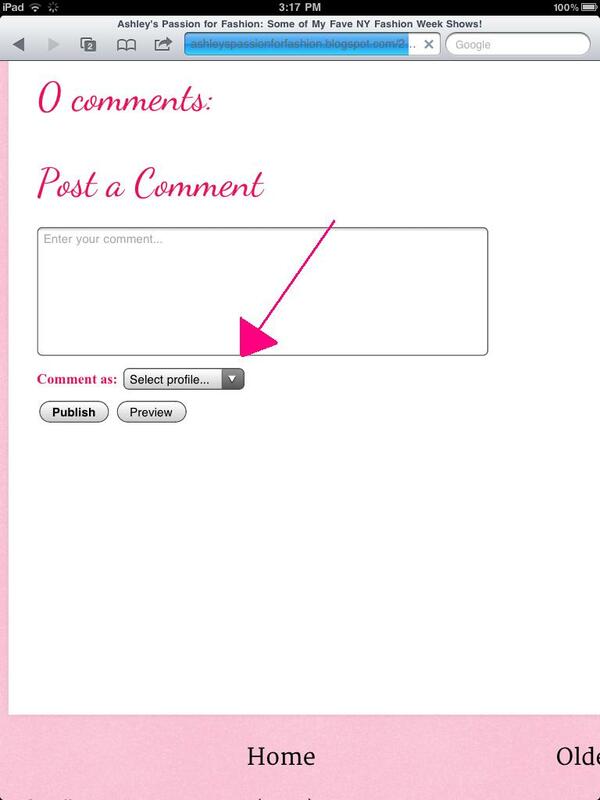 Here is a quick little “tutorial” on how to leave comments even if you don’t have a blog…. 1) At the bottom of the post you want to comment on, click the "___ Comments" link. 2) A window will come up that gives you the option to "Post a Comment." 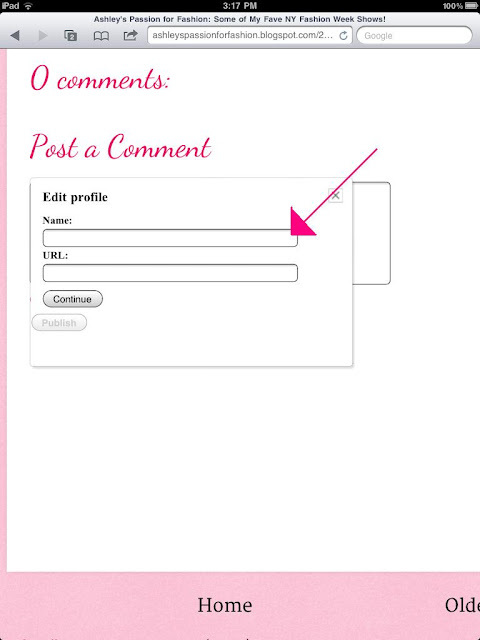 Click the drop-down menu on the "Comment as" menu. 3) On the drop-down menu, click "Name/URL." 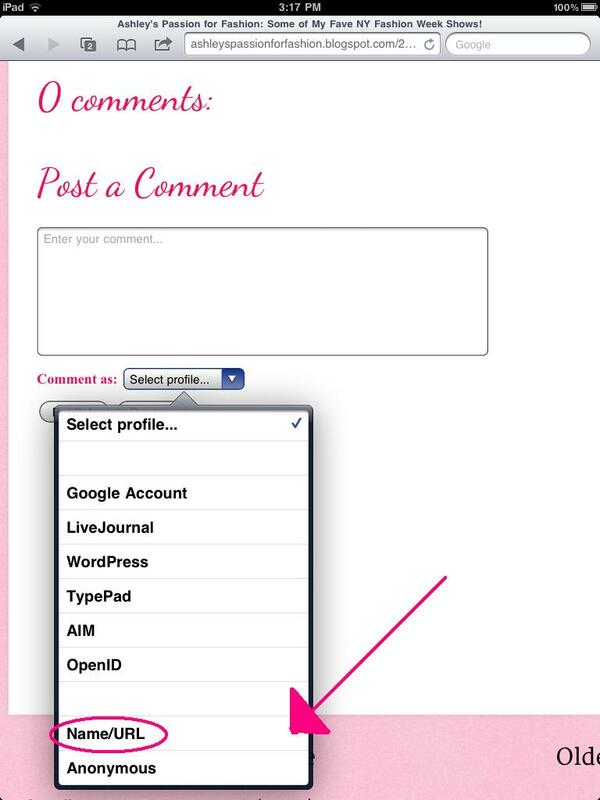 4) A window will pop up where you can type in your name and a URL (optional). When you've typed your name click "Continue." 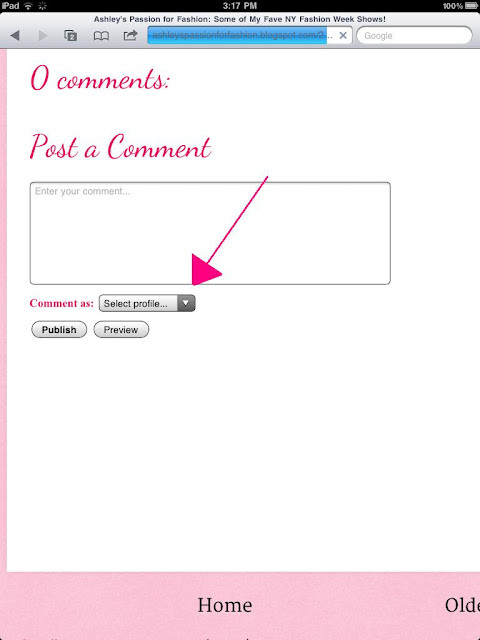 5) Then type in your comment and when you are done, click "Publish" and your comment will appear momentarily on my blog! I cannot begin to tell you how much I appreciate your comments!!! Hopefully now my readers who do not have a blog will be able to comment. Please let me know if you still have trouble commenting! And once again thank you SO much for taking the time to read and comment. It means so very much to me!!!! I will leave you with a question....what are you most looking forward to wearing this spring!? Follow the above steps to leave me a comment & let's see if these instructions worked! Be sure to check back for a nail post (gettin' my nails done tomorrow) later this week!!!! And if you haven't already, like my Facebook page by clicking HERE!